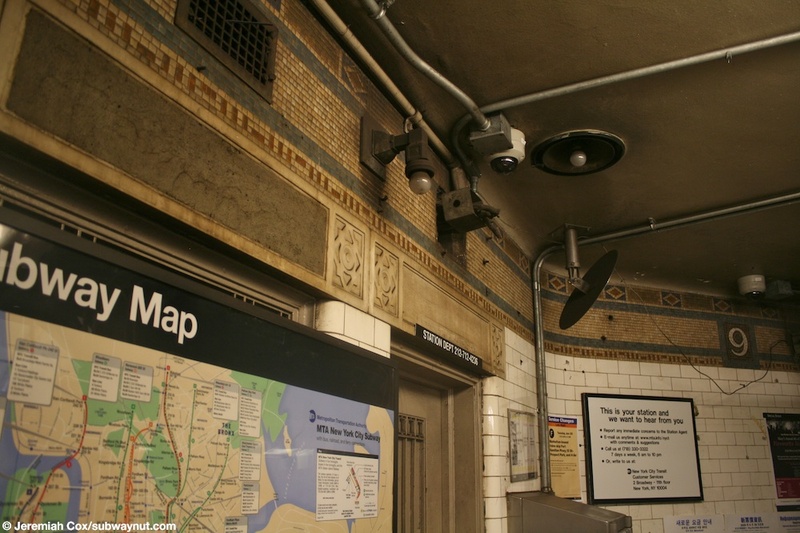 The 9th Street Station is a typical 4th Avenue Line local stop that saw the 1960s cinder blocking and covering of its original 1910s Vickers dual-contracts era name tablets and trim-line. 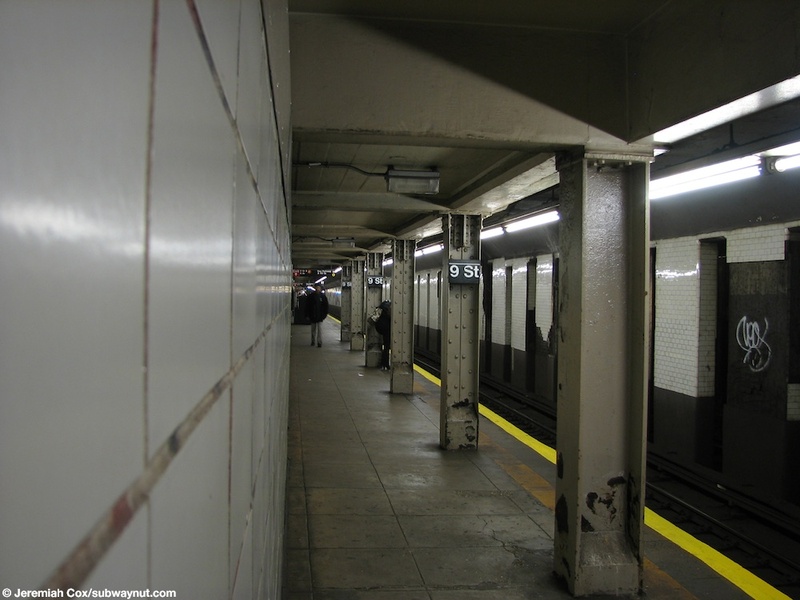 The station has two side platforms, and tiled walls between the local and express tracks. 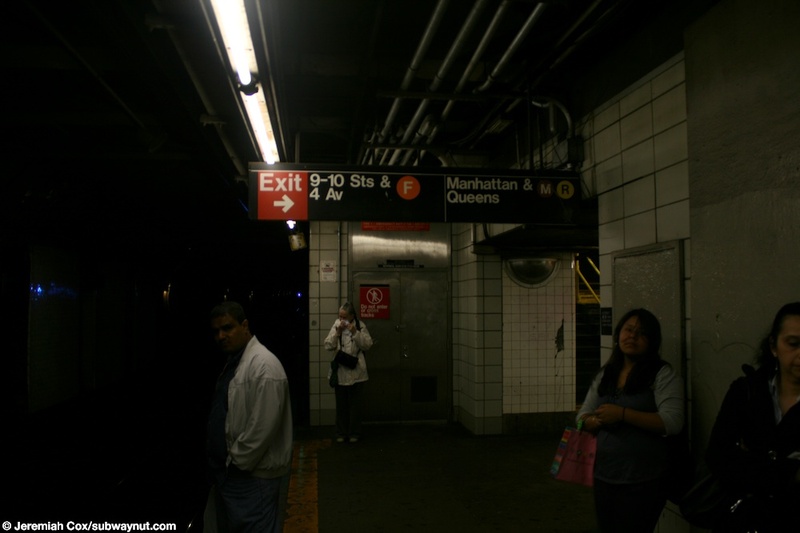 The stations original exits are in the middle of the platforms, directly on them. 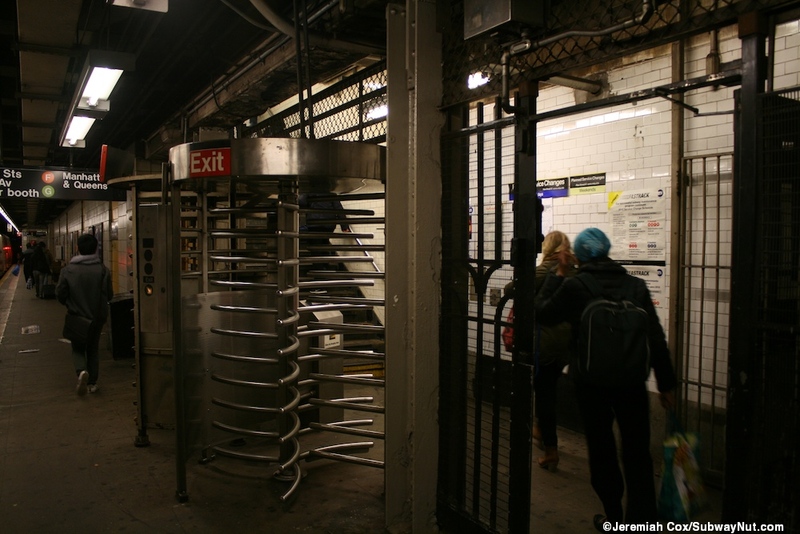 The Manhattan-bound platform has turnstiles and the full-time token booth, with a single staircase up to a corner of 4th Avenue & 9th Street. 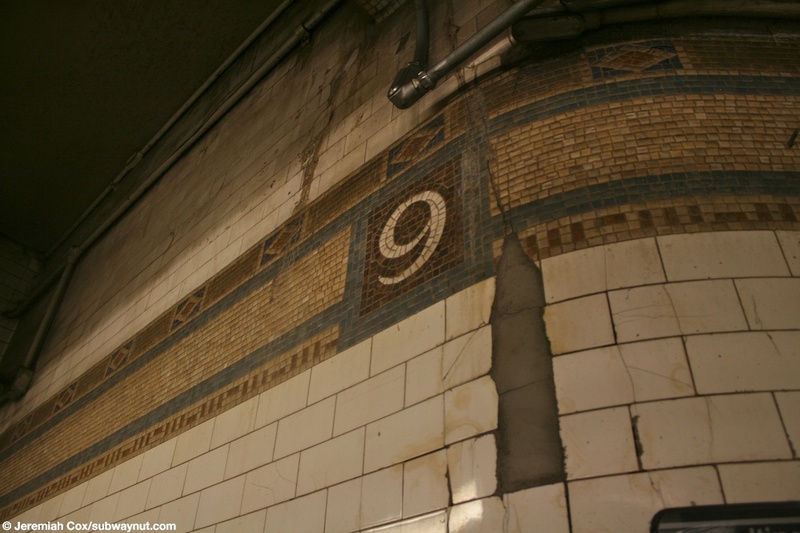 Along the walls of this cramped platform side fare control area the a brief portion station's original mostly brown trim-line can be scene, there are 9s on it at regular intervals as would be expected. 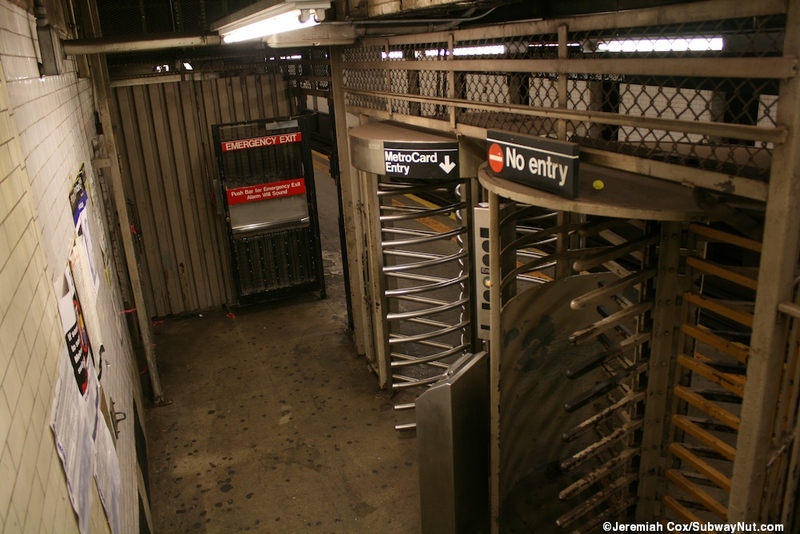 The Bay Ridge/Bensonhurst-bound platform has only a High Entrance/Exit Turnstile, and a High Exit Turnstile up to its one staircase at street level. 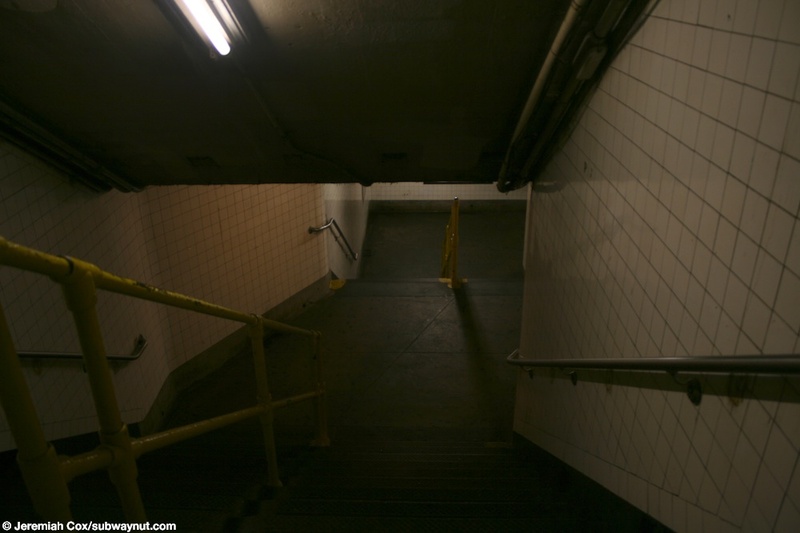 There is evidence here of a former turnstile area in the form of a dark gated off portion at the entrance, meaning this area was bigger at one time. 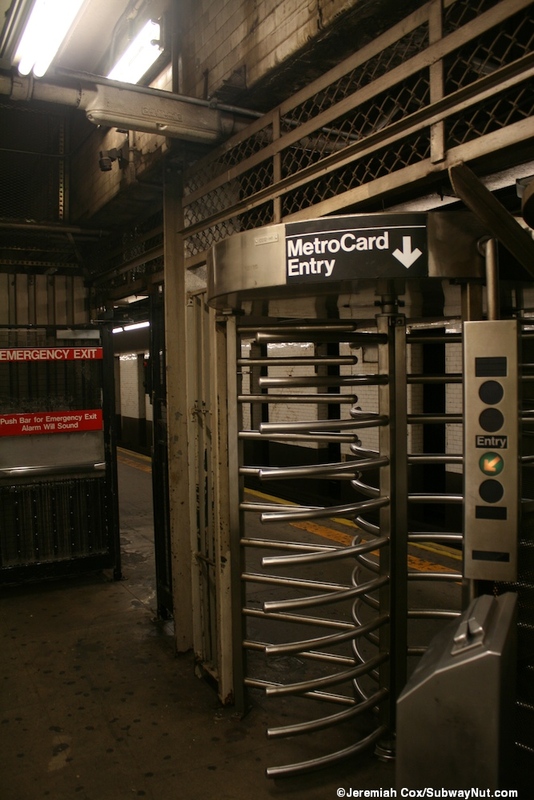 Full time fare control for the southbound platform is shared with the F trains fare control area on the west side of 4th Avenue, between 9th and 10th Streets directly at street level, underneath its Culver Viaduct. 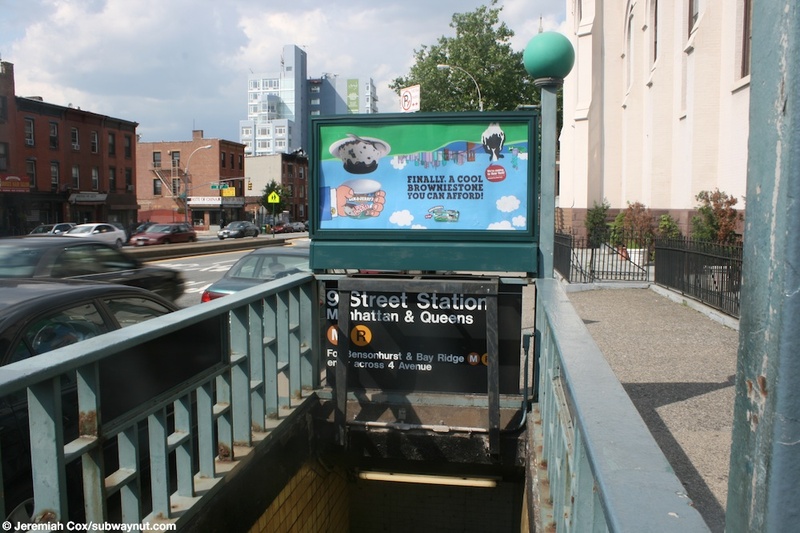 The transfer to the F train on its Culver Line Viaduct is from a single staircase at the southern end of each BMT platform. 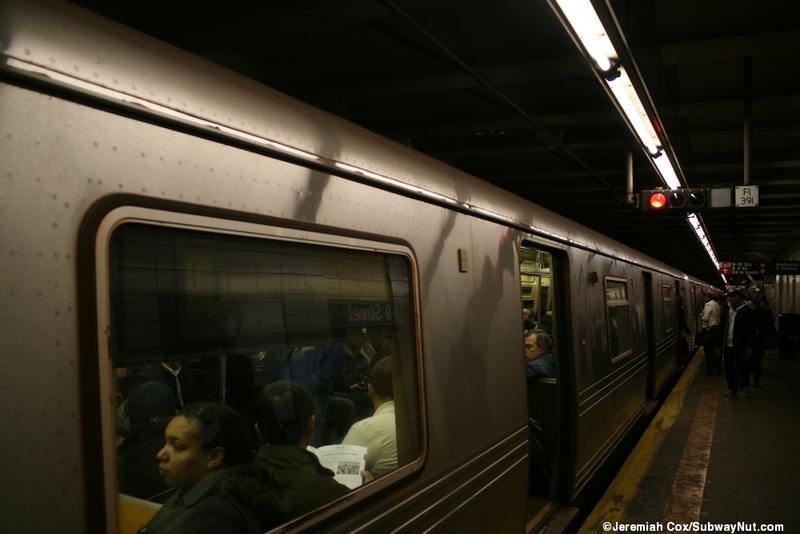 Passengers can transfer free between BMT train directions but must climb a series of staircases up to the IND's elevated platforms before coming back down again, ascending and then descending three or four stories. 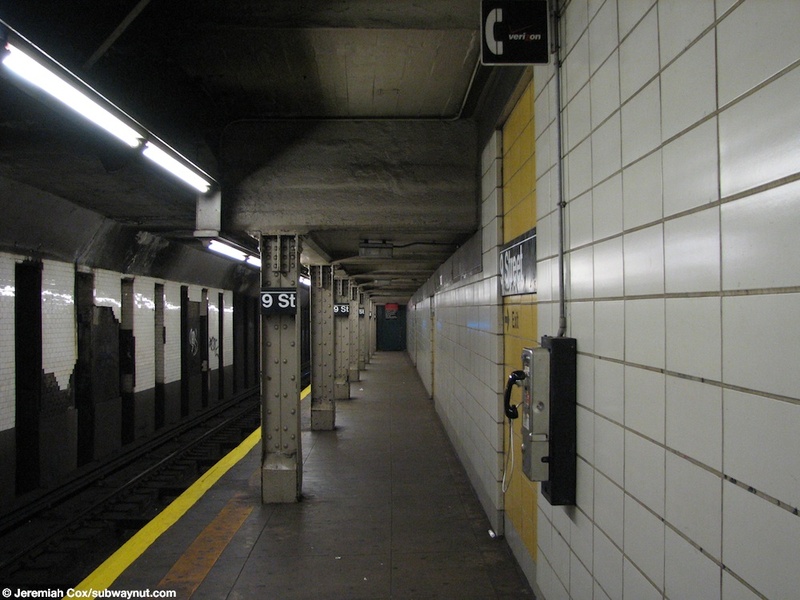 (9m1) Approaching the extreme northern end of the Manhattan-bound platform at 9 Street, where the platform was extended. This is the only location with I-beam columns and the ceiling gets significantly lower. 21 October, 2005 (9m2) A 9 Street platform sign on a portion of the platform wall that's painted with Exit next to an arrow beneath it directing passengers to the station's exit. 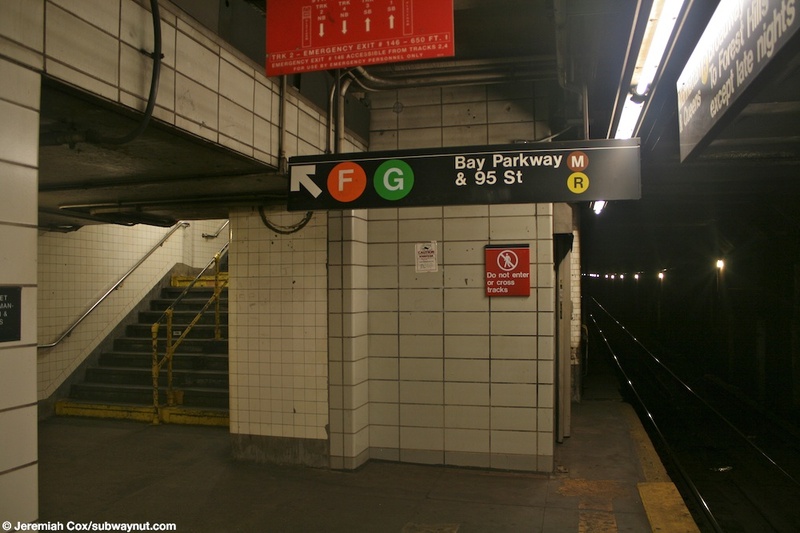 This text beneath the station's signs don't acknowledge the transfer to the IND and the F train at all. 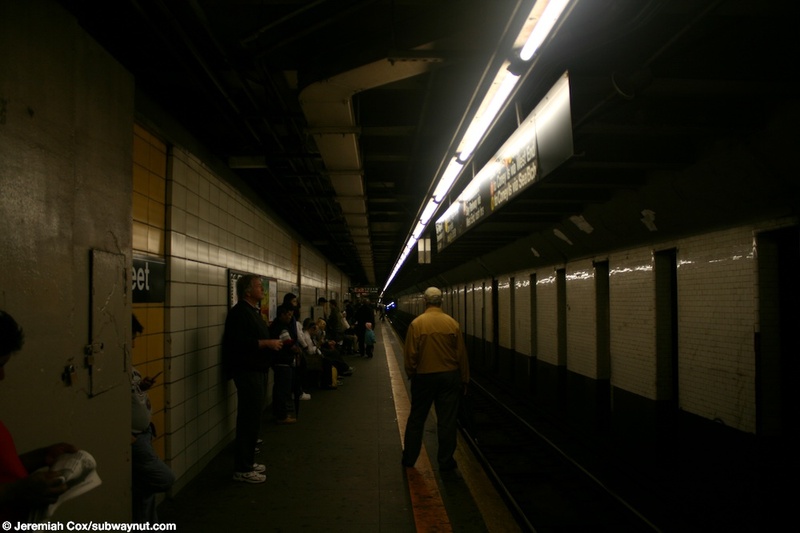 21 October, 2005 (9m3) Looking down the ended portion of the platform at 9th Street, its extreme northern end where platform columns are and the ceiling is lower. 21 October, 2005 (9m4) Looking down the staircase from the main fare control area at street level and the F train's transfer to the Bay Ridge/Bensonhurst-bound platform at 9th Street. 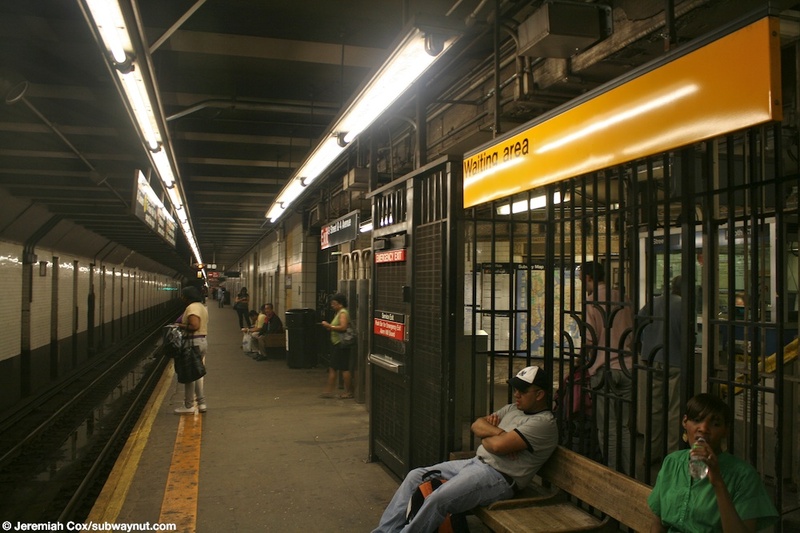 (9m5) Many passengers wait for a Brooklyn-bound local train at 9th Street. 5 June, 2009 (9m6) The sign for the F trains transfer, exit, Manhattan & Queens M/R pointing at the single staircase up to the transfer area at the extreme southern end of the southbound platform at 9th Street. 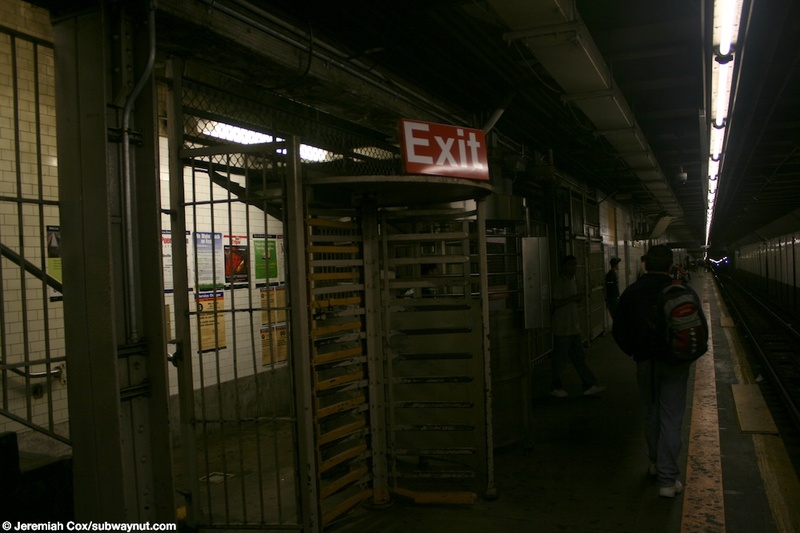 5 June, 2009 (9m7) An old wooden High Exit Turnstile at the single exit staircase that's directly on the Bay Ridge/Bensonhurst-bound platform at 9th Street. 5 June, 2009 (9m8) An old style fence near the unstaffed fare control area on the southbound platform at 9th Street. 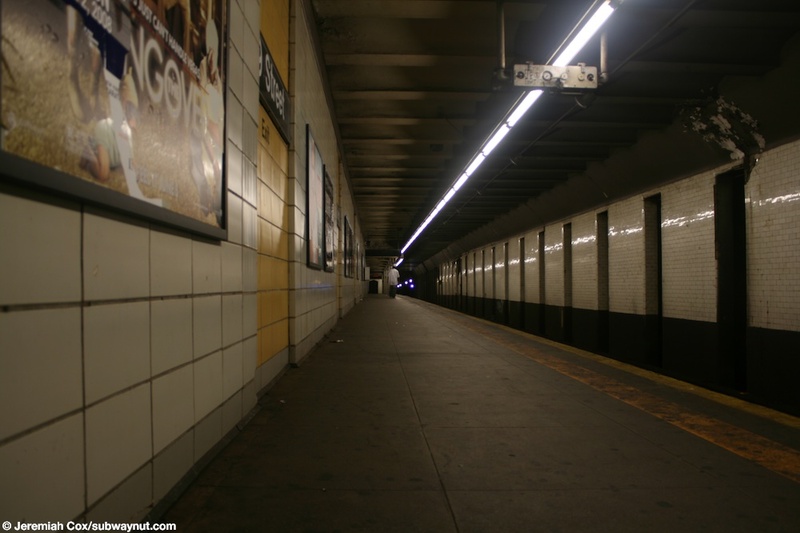 (9m9) Looking back down the Bensonhurst/Bay Ridge-bound side platform, with the white tiled wall between it and the express track at 9th Street. 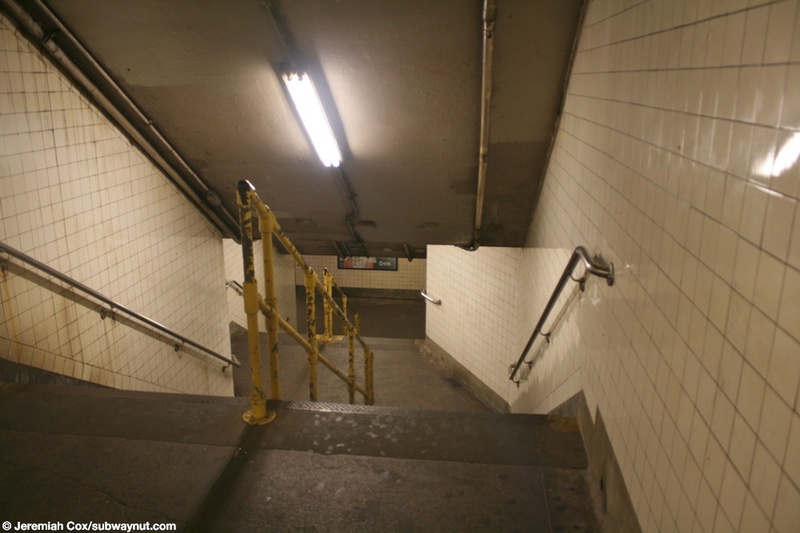 9 June, 2009 (9m10) The similar looking staircase down from the F trains overhead platforms that take transferring Manhattan-bound passengers at 9th Street. 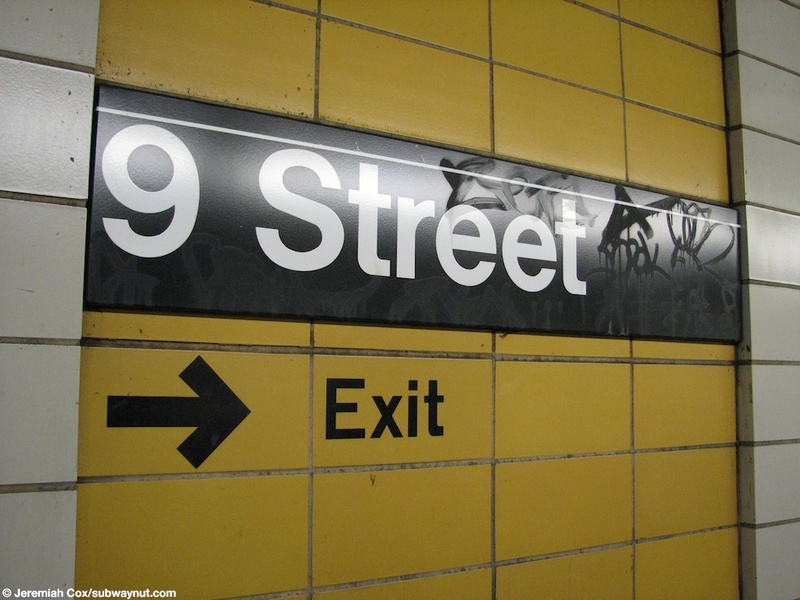 29 June, 2009 (9m11) G has been added to the transfer sign at the entrance to the staircase that begins the journey up to the F trains elevated platform at the extreme southern end of the Manhattan-bound platform at 9th Street. 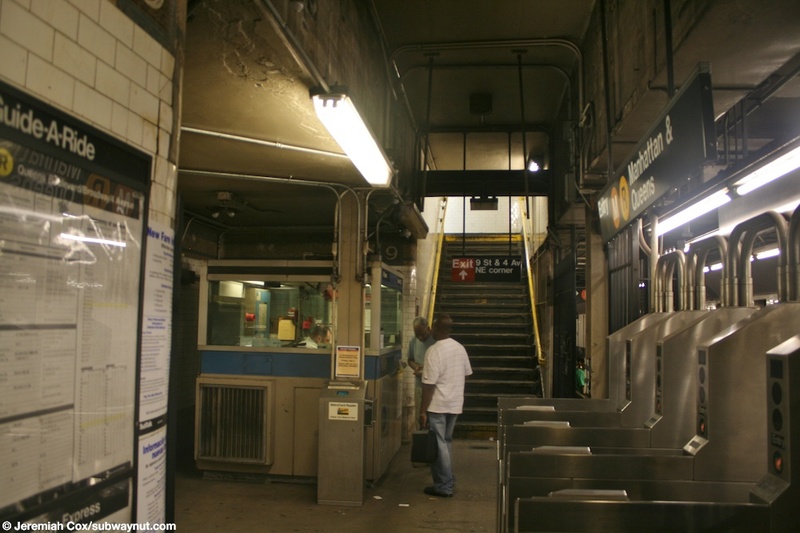 29 June, 2009 (9m12) The main fare control area for the Manhattan-bound platform at 9th Street has turnstiles and is staffed full time. 29 June, 2009 (9m14) Looking along the bank turnstiles for Manhattan & Queens M R trains and the single staircase up to street level in the background, along with the token booth. 29 June, 2009 (9m16) The single entrance to the Manhattan & Queens trains at 9th Street with the wide 4th Avenue in the background.